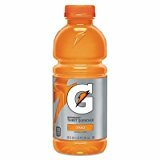 QKR28674 - Gatorade Thirst Que..
Thirst Quencher Orange 20 Oz B.. Product weight is 35.8 lbs. Beverage_Type - Sport Drink Flavor - Orange Packing_Type - Plastic Bottle Capacity_Volume - 20 oz A scientifically proven blend of carbohydrates and key electrolytes designed to help athletes and active people hydrate, refuel and push through. Beverage Type: Sport Drink Flavor: Orange Packing Type: Plastic Bottle Capacity Volume: 20 oz.